Selfridges have thanked the public for their support following a ‘smash and grab’ raid at the world-famous department store last night. 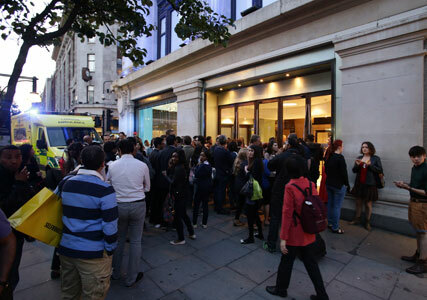 The incident occurred around half an hour before the Oxford Street store was about to close, and while a beauty event was taking place. Shoppers took to Twitter to explain what had happened, with some believing the commotion to be the result of a shooting – but police later denied any shots were fired. 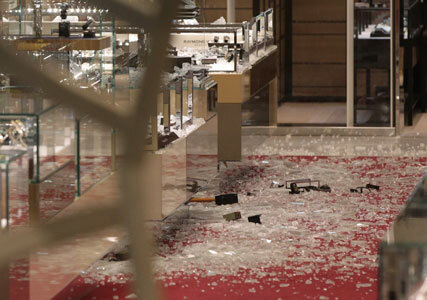 A Metropolitan Police spokesperson said that a gang armed with axes had burst into the store and smashed display cabinets to steal items of jewellery. An image of two abandoned axes was circulated on Twitter, as well as pictures showing smashed glass and crowds of people gathering outside the store. A spokesperson says: “Police were called at approximately 8.30pm to reports of a smash and grab inside commercial premises on Oxford Street. The two men were injured as they attempted to flee the scene, and were treated by an ambulance crew on nearby Charlotte Street after coming off a moped. Onlookers tell Sky News that passers-by attempted to get involved and detain the men until the police arrived.